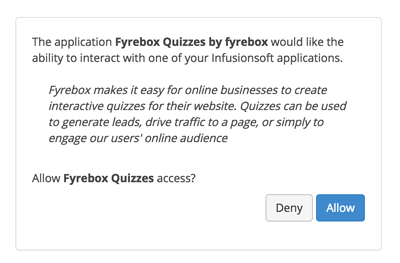 If you use Infusionsoft for your CRM and online Sales & Marketing needs, you can now connect your quiz directly to your account. You can send the contact information of the players directly to your CRM and make it easy to quickstart your sales cycle. 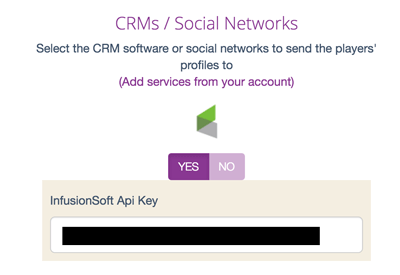 When your account is connected to Infusionsoft, you can now enable the connection between your quiz and your CRM. Just visit the “Edit” page of your quiz, scroll down to the Integrations and flip the switch showing the Infusionsoft logo. The API Passphrase is simply a password, or series of words that will be used to generate your unique API key. Be sure to remember your passphrase if you ever need to generate your API key again. If your API key is correct, from then on, all the leads that you collect on your quiz will be sent directly to InfusionSoft. If you haven’t heard of them : Infusionsoft is a private company that offers an e-mail marketing and sales platform for small businesses, including products to streamline the customer lifecycle, customer relationship management, marketing automation, lead capture, and e-commerce. It is based in Chandler, Arizona. In 2013, Great Place to Work and Fortune Magazine ranked Infusionsoft 17th Best Medium Workplace. In 2011, it was ranked 15th Best Small to Medium Workplace in America.